Gamification is an emerging trend that has been touted as a driver of measurable productivity improvements for all types of industries. If you haven’t heard of gamification, it is defined as the application of game mechanics, elements, and features to non-game situations. In the organizational context, it takes the “fun” aspects of a game and applies them to business processes. The aim of gamification programs in the workplace is to boost employee involvement and commitment to organizational goals, which in turn will enhance productivity and reduce employee turnover. Gamification systems take typical work activities and present them in a game-like situation. The game is made possible by defining engaging, tangible goals to pursue and exceed. Different achievements allow employees to attain rewards defined within the gaming system. For example, sales employees might get achievement badges for identifying a requisite number of sales leads or medals for surpassing sales goals. Moreover, these systems allow for employees to be recognized among their coworkers, and therefore, may encourage healthy competition. Creating competition among employees not only helps increase productivity and profitability but also fosters stronger social ties among employees. Strong social ties among coworkers are associated with better performance and lower likelihood of turnover. In a recent study, we partnered with a large retail organization that employs gamification principles in its training platform. Employees compete with one another by completing training and learning modules. The training interface rewards employees with medals and badges that are achieved by meeting and exceeding goals associated with completing learning modules. The platform had high visibility within the organization, as all employees were encouraged to participate and could observe the levels of achievement among their colleagues. If involvement in gamification systems increases productivity and engagement, we would expect to see higher levels of job performance and retention likelihood in the individuals who are more involved and successful in the gamification system. 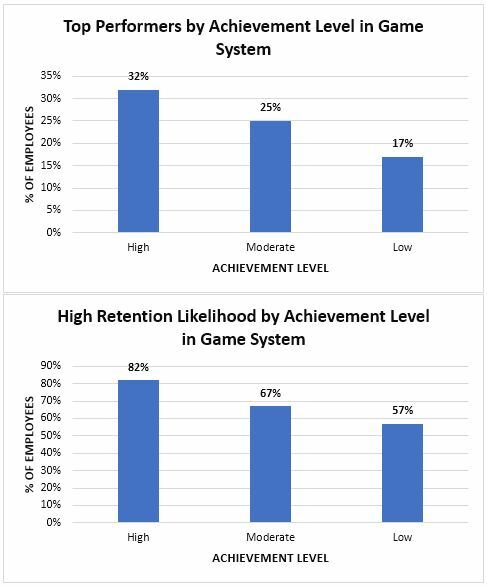 Thus, we compared the job performance and retention likelihood of employees who achieved high, moderate, and low levels of success on the gamification system. As expected, employees who achieved a greater number of medals and badges were twice as likely to be rated as “Top Performers” by their supervisors. These individuals were also over three times more likely to be rated as very likely to stay with the organization. So, it seems that, at least in this organization, the gamification system is linked to some positive organizational outcomes. Have well-defined goals and behaviors the organization wishes to achieve and encourage. Proper planning is important. Don’t neglect to consider company culture when determining what will be effective motivators for employees. Include activities that are tied to tasks that have meaning to your employees. Rewarding employees for mundane, simple tasks may not be effective. The organization in the illustrative study discussed earlier was successful at gaining engagement, as the tasks were tied to an enriching learning experience that contributed to overall career development. 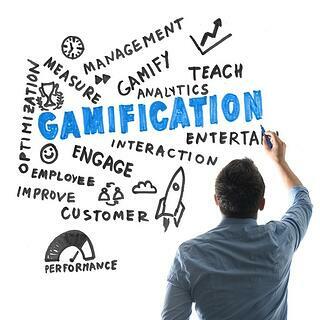 Ultimately, gamification is about engaging people and motivating them to achieve goals. That cannot be successfully achieved with uninteresting elements that do not intrinsically motivate employees. Ensure that the program has high visibility and is inclusive of many in the organization. This is critical to engagement and success of the gamification program. Expect modifications to the system. Consistent monitoring will ensure gamified programs stay in line with organizational goals and strategic objectives. If done correctly, organizations can employ gamification principles to influence their employees’ behaviors which can lead to improved business outcomes. 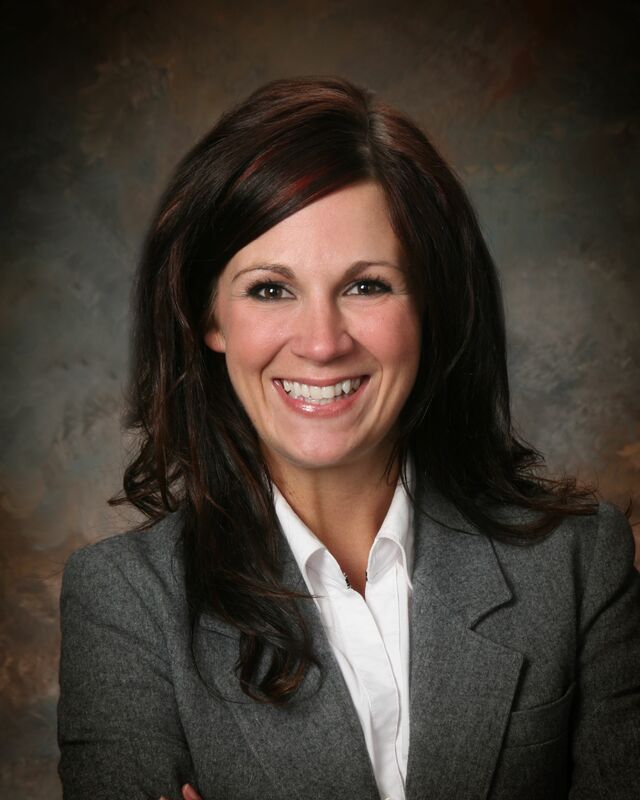 Interested in emerging technology trends in the HR space? Learn more about emerging technology trends in employee selection in our whitepaper, below.